5" x 5" up to 8" x 10"
Cobble stone isn't always rectangular. In many parts of the world cobble is made from rounded irregular shaped stones that appear to have been tumbled by rushing river water. Our Carmanah Cobble Veneer is a thin natural stone veneer in a uniformly soft antiqued charcoal grey. Comprised of rounded and elliptical stones that resemble smaller shaped fieldstones, this product also has softer edges and finish than you'd find with river rock. Stones range from 5" x 5" up to 8" x 10". Use it sparingly as a unique decorative feature, or over larger areas as an authentic, durable cladding. 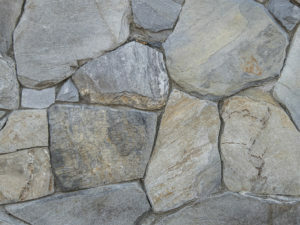 Cobble is a rustic treatment that adds a rural, cottage-y feel to the exteriors of smaller homes and interior rooms. Outdoors, it can work as an accent around windows and doors, or as cladding on the lower half of the facade. It is also a great natural treatment for garden areas, out buildings and outdoor fireplaces and chimneys. Indoors, Carmanah Cobble Veneer can warm up a family room, or add floor to ceiling drama as a fireplace surround. Or, use it to frame a wood stove. 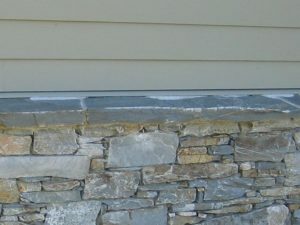 The color complements any palette – whether it's earth tones or, the natural hues of other stone veneer or timber treatments. In certain spaces – a wine cellar, mudroom or powder room for example, this type of cobble treatment can be used to evoke a sense of history or natural splendor. Cobble is a classic look that adds character no matter the application. The cool monochromatic greys anchor an otherwise warm color palette. It is rustic enough to work well with traditional, cottage, craftsman and modern European architectural styles. And it's versatile enough to work with select contemporary styles as well. The installation of natural stone products like Carmanah Cobble Veneer can add lasting value and beauty to almost any home.